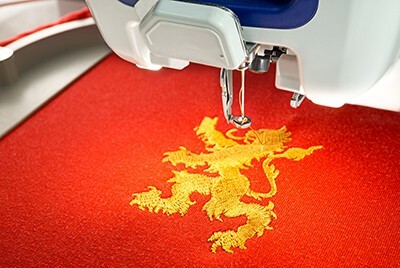 Embroidery of your logo is the application of thread to a garment. Firstly the logo is digitised. This means our experienced digitiser takes your logo image and converts it into stitches. We then send you a proof showing an image of how the logo will look on the garment for you to check and approve. The digitised logo is then loaded into an embroidery machine. Garment are placed into special embroidery frames which hold them securely in place in the machine. Thread colours are assigned to the design to match your logo. 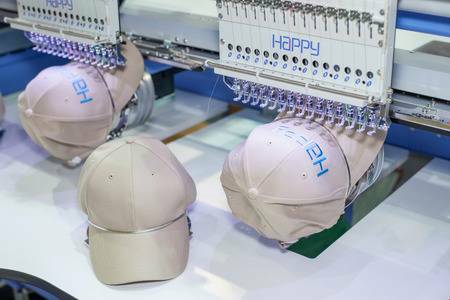 The machine then embroiders the logo onto multiple garments at once. The price of embroidery depends on the number of stitches in the logo and the quantity of garments being embroidered. Due to the time required to set up the machinery, the higher the quantity of garments the lower the unit price of embroidery. Send your logo to us for an embroidery price quote. A one-off set-up fee applies to small embroidery orders. A precise colour match to a PMS colour cannot always be achieved.